Last month Thee Oh Sees and Total Control made their way around the country [they somehow managed to pass over Nashville again… what is the deal with that?] 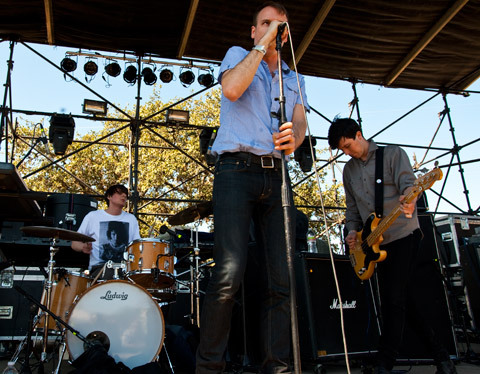 We caught them at FunFunFunFest and were totally blown away by the Australians. This tour was their first trip to the states [as a commenter points out, the guys were here a while ago for GonerFest 7] and we can only hope that they’ll be coming back sometime soon. We’ve spent a good bit of time spinning Henge Beat, the band’s debut album released earlier this year, and we’re constantly finding ourselves wondering how these Aussies do it. From ECSR to UV Race to Boomgates to Total Control to blah blah blah — they just kill it. Memphis zine, ACHTUNG, sat down with Daniel Stewart of Total Control to ask some questions and we highly suggest checking it out. You can do so right here. Check out the track “Carpet Rash” below and scoop up the LP from Iron Lung Records here.